Squires Cafe | Buy Squires gift cards. 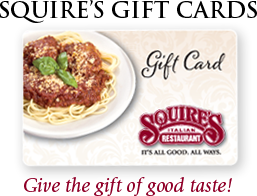 Squire’s gift cards make the perfect gift of deliciousness! Safe and secure credit card payments accepted through paypal. No paypal account needed. Click Checkout and Pay as a Guest!